During January, I received a series of questions via Ask Evangelism Coach. A series of posts this week will focus on sharing these. It’s my hope that our readers will join in the conversation. I know God called me as an evangelist. I have no personal evangelism plan and feel a need for one . 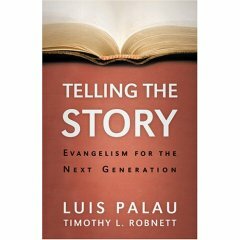 Telling the Story: Evangelism for the Next Generation, by Luis Palau, Timothy Robnett. They answer your question in depth. As I read your question, I see that you have two in there. One regarding a strategy, and the second about developing your calling. I’ve written about this before in Do you have a Strategy for 2009? There you will find additional links about developing a plan. Develop a reading plan of evangelism books. Find and attend evangelism conferences. Use Facebook groups for evangelists (search for them). Learn how to use gospel scripts when God has opened the door. Learn how to recognize the working of the Holy Spirit. Shameless plug: grab my Evangelism newsletter to stay informed about free online evangelism training events and exclusive tips. In Chapter 3 of Telling the Story: Evangelism for the Next Generation, Luis Palau writes about how an evangelist can begin to live out his calling. I’ll simply put forth the summary. Order your copy of Telling the Story: Evangelism for the Next Generation to read the whole thing. I need books and videos on evangelism to build me up as an evangelist and I’ll like to know if there are free online courses for evangelist I cannot afford most of this materials that why I’m asking for help please. God bless you as you respond urgently. I ditto this message… I need books and videos on evangelism to build me up as an evangelist and I’ll like to know if there are free online courses for evangelist I cannot afford most of this materials that why I’m asking for help please. God bless you as you respond urgently. All of my resources are available in the store. All of the over 1000 articles on this website are free for you to print, share, learn from and more. You can print them, book mark them, share them, and reuse them in your own work as long as you give credit to the original page. please sir, i need an orientation more on soul winning and to develop more on evangelism as a calling. i need help or if there will be a free seminar online, i will like to join.